This year’s summit will consist of back to back panel discussions and keynotes from leading experts. This year’s topics will include entrepreneurship, career development, networking, time management and much more! 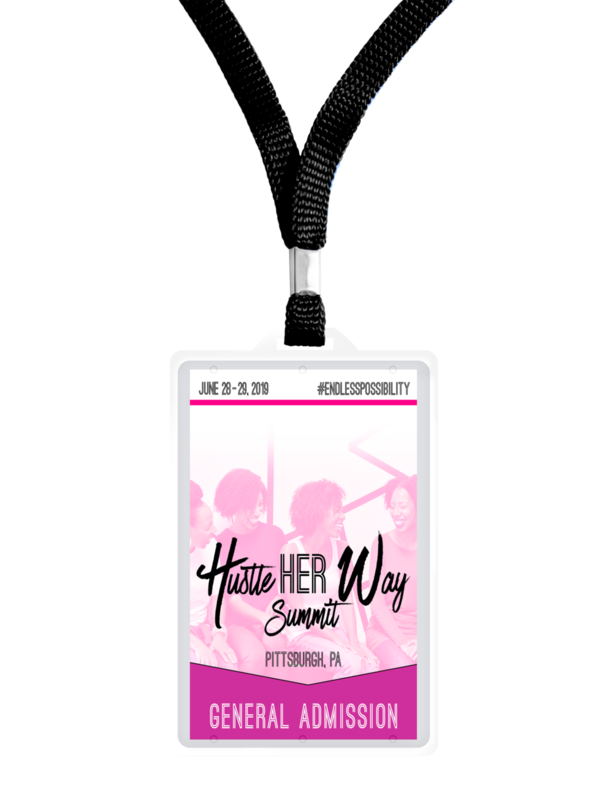 Hustle HER Way is not just another empowerment summit. We cultivate an experience with women who have the same level of ambition and drive as you. The women who attend aren’t there for selfies alone. They attend to build meaningful lasting relationships. This year we’re offering a pop up Brand Check Up Station, Business Legal Clinic, Beauty Bar and much more. We also can’t forget our famed Hustle HER Way gift bag, catered breakfast and much more. This is a summit experience you’ll never forget. The event not only aims to provide actionable content in the form of workshops but provides attendees with a unique opportunity to build a powerful network. This is the event where women come together to share, collaborate and grow. The 2016, 2017 and 2018 summits sold out quickly so join our mailing list to be the first to know about early bird registration. The 2019 summit agenda will include keynote talks, panel discussions and breakout session workshops, all with the aim to aid you in blazing trails and overcoming obstacles in your way. Opportunities to network and engage intentionally with fellow attendees will occur through the summit. Lastly, attendees will have an opportunity to support women owned businesses as we will have several dynamic vendors in attendance. 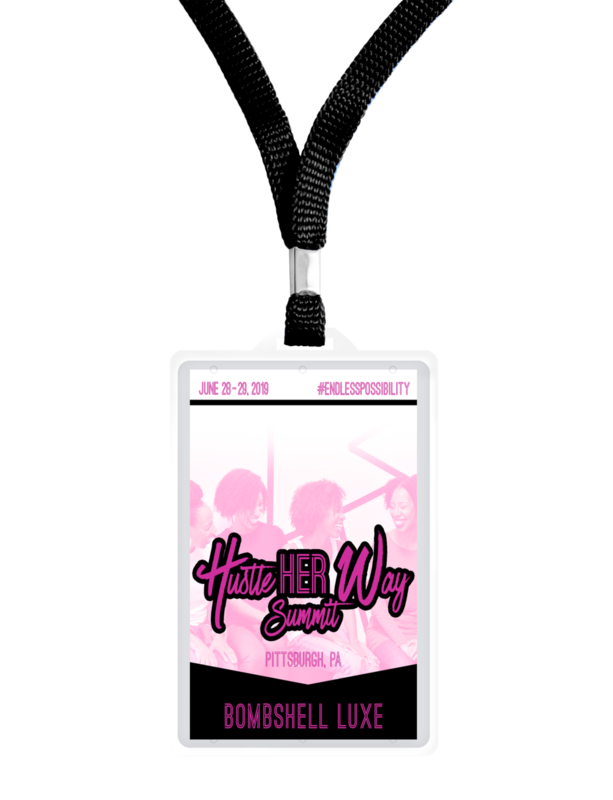 Hustle HER Way will take place June 28 - 29, 2019. This year, we’re switching things up at bit! Take a look below to see what you can expect. The summit will kick on Friday, June 28th at 6pm with the Profit Power Event. This is exclusively for Bombshell Luxe “VIP” ticket holders and is meant to be sales and marketing mastermind. You’ll hear from expert speakers on how to position your brand for profit! The full summit experience will commence on Saturday, June 29th for all ticket holders. The day will include a catered breakfast, several dynamic panels, keynote talks, vendors and much more! Bring your notebooks ladies because our speakers are bringing it! This year, we’re excited to offer an onsite Business Legal Clinic, Brand Check Up Station, Beauty Consultations and much more! Upon purchasing your ticket, you’ll have the chance to sign up for 1:1 experiences during the Saturday Summit. Early bird tickets will go on sale on November 12th. Below you will find the summit pass options and early bird pricing. Join our mailing list to be notified of when tickets are available. The general admission pass grants attendees access to the Saturday Summit activities including the panels, brand activations, summit gift bag and breakfast. The Bombshell Luxe pass grants attendees everything that is included with general admission and access to the Profit Intensive Roundtable event on the evening of 6/28. The Bombshell Elite Pass includes everything is included in the Bombshell Luxe pass and access to the Power Elite Mastermind event on the morning of 6/28. Kyshira S. Moffett, MBA is a digital brand strategist, content creator, award winning entrepreneur, and author. Passionate about brand strategy, entrepreneurship, and beauty, she is living her motto “feel the fear and do it anyway” every single day. In 2013, Kyshira founded The KSM Group, a boutique brand consulting firm which equips entrepreneurial women with digital brand and launch strategies to propel their businesses and blogs to the next level. Kyshira is also the creator of #HERMovement, a successful business and lifestyle blog that highlights ambitious, millennial women on their pursuit to professional success. Since 2013, #HERMovement has more than 20K global followers, grown into a community of more than 2K members on Facebook, hosted a successful monthly Twitter chat which has been featured in EBONY Magazine, and expanded into a YouTube channel and podcast known as The Bombshell Diaries. 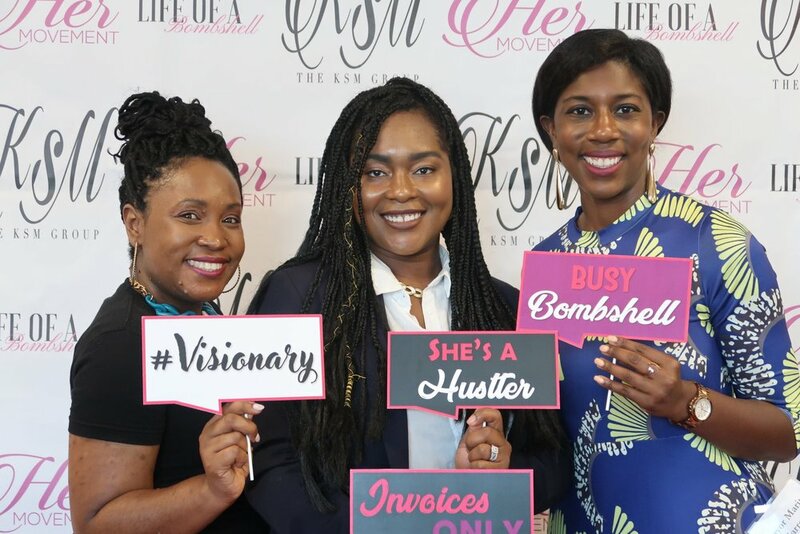 With a demand for more in-person engagement, empowerment, and impact, Kyshira created and facilitated the Hustle HER Way Summit in Pittsburgh, PA which sold out for the second time in a row this year! This two-day conference united professional speakers from around the nation to connect with and educate entrepreneurial women from diverse cultural and professional backgrounds. The summit has since received rave reviews and will be back again in Summer 2019. Keeping up the momentum, Kyshira shows no signs of slowing down. Adding her passion for beauty to her portfolio of brands, she launched Life of a Bombshell Cosmetics in 2017, offering premium makeup products at an affordable price to women who are movers, shakers and jetsetters! She also published her first book, “Bombshell of All Trades”, a planner packed with actionable brand strategies for women who run side hustles and creative businesses. 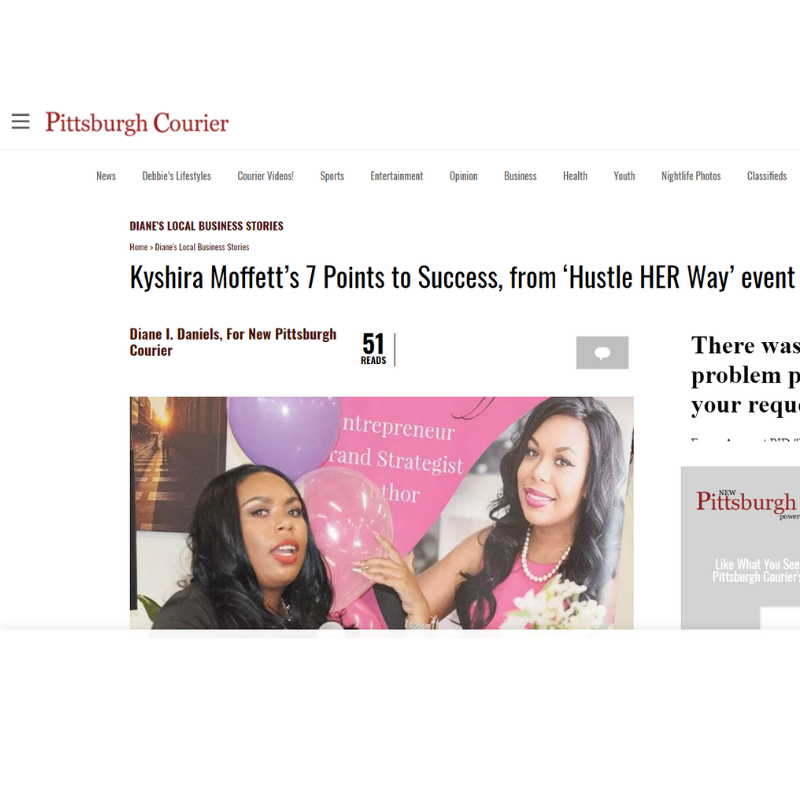 When Kyshira is not busy growing her Bombshell empire, she’s an active member of the Greater Pittsburgh community. She continues to exercise her expertise in training, facilitation, and public speaking by hosting workshops for professional organizations in the areas of personal branding, entrepreneurship, and the power of social media. She is also currently the president of the National Black MBA Association, Pittsburgh chapter. Sign up with your email address to receive news, updates and to be notified of early bird tickets.